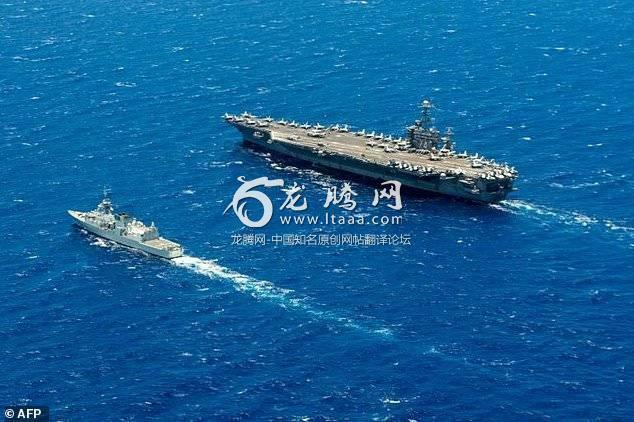 The Pentagon has pulled its invitation for China to join maritime exercises in the Pacific because of Beijing's 'continued militarization' of the South China Sea amid increased tensions between the two nations. China hit back at the decision, calling it 'very non-constructive' and saying it was taken without due reflection. Held every two years in Hawaii, the Rim of the Pacific (RIMPAC) exercises involved more than 20 countries including India, Japan, the UK and - for the past two events - China. China was invited to join the RIMPAC, which the Pentagon is the biggest military exercise in the world, under the Obama administration as a way to boost relations with Beijing and encourage the country to stop the militarization of a group of disputed islands in the South China Sea. But Defense Secretary James Mattis has chosen to withdraw their invitation this year, after China landed a Chinese bomber on one of those islands, as well as their recent deployment of missile systems. 'China's continued militarization of disputed features in the South China Sea only serves to raise tensions and destabilize the region,' Pentagon spokesman Lieutenant Colonel Chris Logan said. 'It's also a decision taken lightly and is unhelpful to mutual understanding between China and the US,' Wang said at a press conference with Secretary of State Mike Pompeo after the two met in Washington. Pompeo did not comment on the matter, saying only that the pair had had a 'good discussion' about American concerns of militarization of the South China Sea. Another shameful legacy of the obozo adminstration - good riddance. So glad we did this. Very few of us in Hawaii could understand the strange decision 2 years ago to invite communist China to RIMPAC exercises. Only Obama could understand it I suppose. The Zero did not have the well being of the USA as his top priority. Guess they didn't want made in China assets breaking down in middle of the exercise putting others to inconvenience. 2 billion Chinese will not sleep tonight worrying about missing the party. That half of the world seems to be getting more and more militarized. I feel like Obama would have turned a blind eye and kicked the can down the road but Trump's going to face it head on. It's gonna be rough here as Democrats attack him for being aggressive simply because he deals with issues. Excellent. China has no business in the South China Sea. Paulm: I dont know if you are capable of noticing, but the US doesn't claim 90% of the Gulf of Mexico. So why would China be invited in the first place? Originally it was thought to accomplish two things. One, it was a reaching out to them as a sign of possible friendship. Two, it was to show them the power and skill of the USN. Well it's often cheaper to start with a carrot than a stick - and the other guy's reaction shows if he's a hard case. American masters can do as they like.